We can never think too frequently on the gift of our salvation and the sacrifice Jesus undertook to accomplish it. I suspect this is why Donald Macleod offers no justification for the existence of Christ Crucified, despite it being perhaps “yet another” book on the topic. We need to constantly meditate on Jesus and His work, and a reminder to do so is not unwelcome. However, why not just pick up an old classic book on the cross? 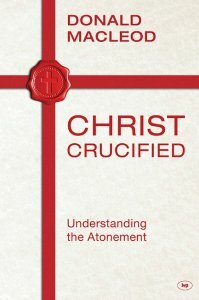 Is Macleod offering something unique in Christ Crucified? Christ Crucified is split into two larger sections. The first, consisting of three chapters, traces the Gospel narratives of Jesus’ life, death and resurrection. The second, in eight chapters, considers “words” that interpret the work of the cross: substitution, expiation, propitiation, reconciliation, satisfaction, redemption and victory. The latter section may sound familiar to anyone who has read books such as Stott’s The Cross of Christ, Morris’ The Apostolic Preaching of the Cross, Murray’s Redemption Accomplished and Applied, and more recently, Peterson’s Salvation Accomplished by the Son. Being a fan of these books and teaching a class on the subject at CCBCY, my first question was, “how is Christ Crucified any different?”. Or perhaps you’ve seen the US cover? Second, rather than following a rigid self-limiting method, Macleod skilfully glides from exegesis to application, devotion, theology, historical speculation, and doxology; impressively without inflicting whiplash on his readers. He is able at one moment to speculate with artistic license on Christ’s horrifying experience on the cross, and then suddenly be knee-deep in a word study or in conversation with a classic theologian. There’s something here for everyone. This fluidity and accessibility sets the tone for the rest of his work and distinguishes it from the above books. Considering the devotional charm of these chapters, it’s therefore ironic (perhaps a sign of my own idiosyncrasies) that I found them the most dull. Adding to the irony, while part two is more enjoyable, it also has more problems. For the sake of space, I will focus on four chapters from part two. Macleod proficiently surveys the debate between Dodd, Morris, and Nicole in the 1960s over these words. With the dust having settled in 2014, Macleod considers “such polarization [as] entirely unnecessary. ‘Expiation’ highlights the effect of the atonement on sin, whereas ‘propitiation’ highlights its effect on God” (p. 110). This walks a fine line, holding both as valid, since “expiation which does not propitiate [is] meaningless” (p. 147). In this context, while discussing 1 John 2:1-2, Macleod takes an unexpected turn to defend limited atonement (pgs. 120-127). For me, this was an unwelcome detour, especially considering Macleod admits that “this question is not addressed directly by the New Testament itself” (p.120). What’s more, by the end his 8-page wide-ranging discussion, “for the whole world” in 1 John 2:2 was never explained! Now, I know proponents of limited atonement have explanations, but it was ironic that Macleod offered none, especially when this passage spawned the whole discussion. Secondly, Macleod carefully distinguishes between being propitious and being loving. Though God always loved the Ephesians (Eph 1:4), they were once under His wrath (Eph 2:3). But I think it goes too far to say that this distinction doesn’t “disappear altogether when we become Christians” (p. 135). More precise wording would have benefited here as this reader is left with questions: can the justified believer find themselves under God’s wrath in any sense? Can God be propitious towards us in Christ, but yet continue to have wrath against us? Yes, God certainly does discipline His children (Heb 12:6), but this is a far cry from His attitude towards those not (yet) adopted as sons as in Eph 2:3 and those given over to sin as in Rom 1:18-32. I think it’s pastorally and theologically incorrect to see Christians being under God’s wrath now or on the last day (1 Thess 5:9; Rom 5:9), so I’m unsure as to what Macleod was wanting to say here. The chapter on reconciliation also has difficulties. Again, much is helpful, but things start going wrong whne he says “Paul clearly equates reconciliation with justification. Indeed, the two are virtually synonymous throughout Paul’s letters” (p. 160). This does not square with Romans 5:1-11, which presents our reconciliation not as parallel with justification, but with a peace with God – a result of justification. Nor does it square with 2 Corinthians 5:18-21, where Paul exhorts believers to be reconciled to God. Nor Colossians 1:19-20, which has demons being reconciled! Macleod recognizes that equating reconciliation with justification causes trouble for Colossians 1:19-20, so he excludes demonic forces from reconciliation, saying, “there is no reference to ‘under the earth'” in Col 1:20; so they “are subjugated, but not reconciled” (p. 165). This is indefensible, however, because Paul’s point in Col 1:20 is that “all things” are reconciled through the cross, and Col 1:16 explicitly includes thrones, dominions, rulers and authorities among “all things”. Surprisingly, Macleod appears to change his mind when he says in chapter 11, “as far as the devil and his demons are concerned the reconciliation takes the form of a pacification” (p. 244). So they are reconciled after all! Not through justification but through defeat. Jesus made peace in regards to Satan through disarming him (Col 2:15). This fits the Biblical data much better, but requires one reject the equation of justification and reconciliation. This would all be resolved if reconciliation were not limited to “the forensic” (p. 169), and seen more broadly as relational; putting things in their right place (i.e. shalom, peace). Thus reconciliation takes different forms in different contexts; shades that are lost in a grayscale approach. How did God make peace with sinners? Justification (Rom 5:1-11). How about Jew and Gentile animosity? By breaking the dividing wall of the Mosaic law (Eph 2:12-21). How are the powers reconciled? Through defeat (Col 1:19-20; 2:15). All of these have the cross at their centre, but take different shades. The final chapter on Christ’s victory over Satan was again filled with valuable insights and encouragements, but again, some issues. One will complain that he ended the chapter (and book) with a defense of Amillennialism, but it was on-topic, and the alternative would have been to neglect a relevant text altogether simply because it is controversial. More problematic were his statements regarding Satan’s authority. After a great quote (“Before Calvary, Satan reigned; after Calvary, he rages but no longer reigns” [p. 241]), Macleod then says that Satan “had no absolute, or even, legitimate, authority” (p. 242), but that it was only assumed. However, Satan did have delegated, and thereby, legitimate, authority. His authority over the kingdoms of the world was not challenged by Jesus (Matt 4; Deut 32:8-9), and God even gives him restricted, but nonetheless real, authority in specific situations like Job’s (Job 1-2). An important element of Jesus’ victory is that Satan’s authority over the pagan nations is taken away and given to Jesus (Matt 28:18) through His obedience, and defeat of sin, death and Satan; a development that is lost if Satan never really had this authority to begin with. As to Jesus being “no less a king during his life on earth than he is in his post-resurrection state in heaven” (p. 239), this seems right at first, but I contend that it’s imprecise. While Jesus as God has always ruled (Col 1), the NT presents a significant development in Jesus’ human kingship throughout His ministry, particularly post-resurrection (Rom 1:3-4; Acts 2:36; Ps 110). In fact, 1 Peter 3:21-22 links this new stage brought about in Christ’s resurrection and ascension with His victory over demonic powers. This is a significant point in Biblical Christology: as our Second Adam, Jesus is the faithful human king as God intended His image bearers to be. Christ Crucified was a difficult book for me to review. I’ve seen a number of very positive reviews out there, so I want to be careful that I do not treat it unfairly just due to some of my disagreements. However, being somewhat studied in this topic, I don’t want to downplay problems I see that others may not. 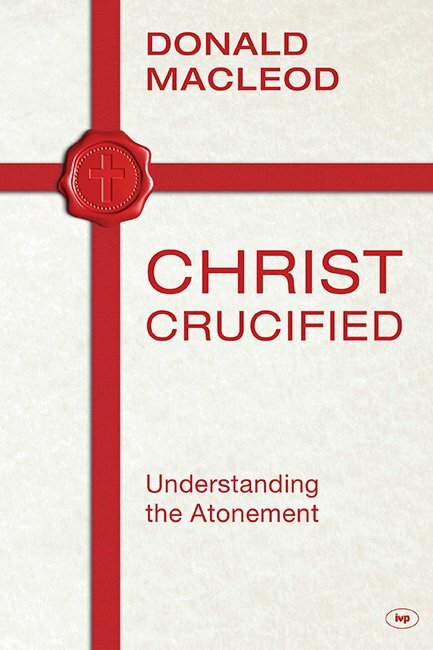 Christ Crucified does offer something unique, particularly in the Gospel treatments and Macleod’s own wide-ranging style. This is certainly more accessible and readable than other works like it. It is a helpful and devotionally moving book that will benefit many; in fact, I would be grateful if it led some to study these doctrines further. We need to continually remember the centrality of Jesus and His salvific work. However, when it comes to the larger second section on the “cross words”, the inconsistencies and concerns make me more hesitant about my recommendation. Sure, Murray and Morris are dense and not so readable for everyone. Stott is becoming dated now, and while Peterson is a great choice, he’s sadly too tied to the Biblical text for some. Unfortunately, Christ Crucified relies on older works and so doesn’t really update the discussion too much, particularly in light of newer scholarship such as the New Perspective camp. 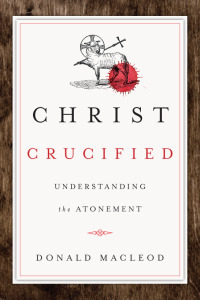 Despite the many strengths of Christ Crucified, I am still waiting; for a book that I can recommend without hesitating, that continues this heritage of cross books, peers deeply into the text of Scripture with fresh eyes, and brings the riches in these doctrines down to a lower shelf for the modern reader. Many thanks to IVP UK for providing me with a review copy. Their generosity did not affect my opinions in this review.